It appears Canon is going backwards and skipping in their naming conventions for the M-series of mirrorless cameras. Last year, Canon released the M10 which was a direct replacement for the M2, though the M3 already existed. This year, Canon is launching the M5, there were rumors about an M4, but all of the tech that was supposed to be in that version seems to be showing up in the M5, including the 80D-esque sensor setup. The new M5 features a body redesign that makes it look similar to an SLR camera, while retaining the size and lightweight features of previous M cameras. It features a 24 MP APS-C CMOS sensor. Canon has described the M5 as being something of a little brother/sister to the 80D as it has many of the same features and tech. These include the DIGIC 7 processor, Full HD at 60p, Built-in EVF and dual-pixel AF. The touchscreen on the back allows for touch and drag autofocus and is multi-angled. Along with the new camera, Canon is also releasing a new EF-M lens. The 18-160mm F3.5-6.3 is a 29-240mm, 35mm equivalent. The lens features an STM motor, and an 8.8x zoom. It adds a seventh lens to the fairly well-rounded EF-M lens line. For more details and full technical specifications check out the press release below. 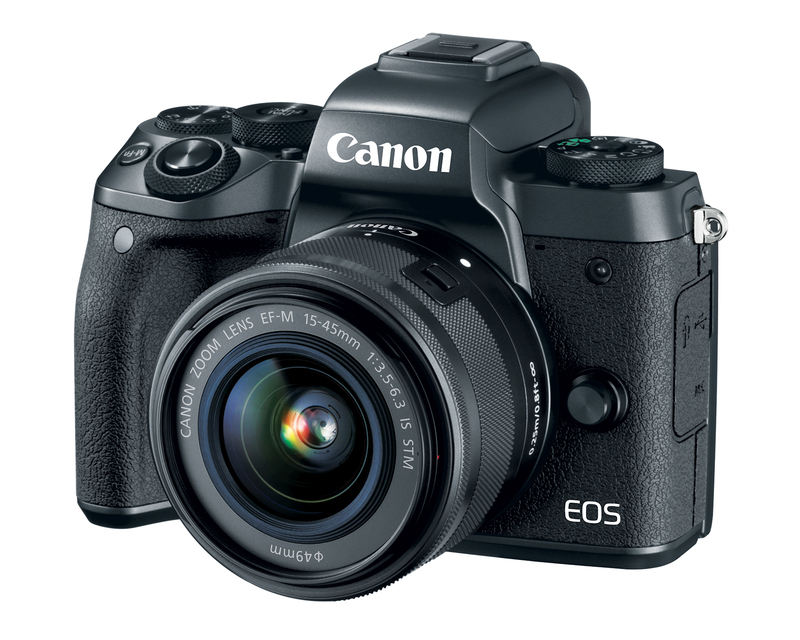 MELVILLE, N.Y., September 15, 2016 – Canon U.S.A., Inc., a leader in digital imaging solutions, today announced the latest additions to its EOS M series system – the new Canon EOS M5 Interchangeable Lens Digital Camera and compact EF-M 18-150mm f/3.5-6.3 IS STM lens. The EOS M5 camera features a 24.2 Megapixel APS-C sized CMOS sensor, DIGIC 7 Image Processor and the fastest AF speed in the EOS M-series[i], enabling photographers to capture clear, sharp, high-resolution images and Full HD videos. It is also the first in the EOS camera line to include the low energy Bluetooth® Smart[ii] feature that can maintain a constant connection[iii] with your compatible smartphone or tablet when you use the Canon camera connect application and both applications are active. The versatile EF-M 18-150mm f/3.5-6.3 IS STM lens is compatible with all Canon EOS M series digital cameras, and is a great option for photographers looking to capture scenic landscapes while traveling to close-up shots from afar. Digital IS with 5-axis image stabilization[iv]when shooting movies plus increased image stabilization with both lens optical IS and in-camera digital IS when shooting with an IS lens. Built-in Wi-Fi®[v] and NFC[vi] allows for easy sharing and transferring of images and videos. Shorter camera startup time[vii] and interval time between each image capture for a more efficient shooting experience. Compatible with EF-M lenses as well as the full line of EF[viii] and EF-Sviii lenses and Speedlites for expanded creativity. Image Stabilizer effect at up to 4[ix]stops of shake correction helps capture sharp images. Compatible with select smartphone and tablet devices (AndroidTM version 5.0 or later and the following iOS® devices: iPhone 4s or later, iPad 3rd gen. or later, iPod Touch 5th gen. or later) equipped with Bluetooth® version 4.0 or later and the Camera Connect App Ver. 1.3.20 or above. This application is not guaranteed to operate on all listed devices, even if minimum requirements are met. When applications are active. Switch from Bluetooth® Smart to Wi-Fi® when viewing the images on the camera via the compatible smartphone. Maximum image stabilization is achieved when using either the EF-M 18–150mm f/3.5–6.3 IS STM or the EF-M 15–45mm f/3.5–6.3 IS STM with the lens firmware update. Compatible with iOS® versions 8.0/8.1/8.2/8.3/8.4/9.0/9.1/9.2/9.3, Android™ smartphone and tablet versions 4.1/4.2/4.3/4.4/5.0/5.1/6.0. Data charges may apply with the download of the free Canon Camera Connect app. This app helps enable you to upload images to social media services. Please note that image files may contain personally identifiable information that may implicate privacy laws. Canon disclaims and has no responsibility for your use of such images. Canon does not obtain, collect or use such images or any information included in such images through this app. Compatible with Android™ smartphone and tablet versions 4.0/4.1/4.2/4.3/4.4/5.0/5.1/6.0. Approximately 66% faster than the EOS M3 camera. Measured at the focal length of 150mm (35mm equivalent of 360mm), using the EOS M3 digital camera based upon CIPA (Camera & Imaging Products Association) standards. [ii] Compatible with select smartphone and tablet devices (AndroidTM version 5.0 or later and the following iOS® devices: iPhone 4s or later, iPad 3rd gen. or later, iPod Touch 5th gen. or later) equipped with Bluetooth® version 4.0 or later and the Camera Connect App Ver. 1.3.20 or above. This application is not guaranteed to operate on all listed devices, even if minimum requirements are met. [iii] When applications are active. Switch from Bluetooth® Smart to Wi-Fi® when viewing the images on the camera via the compatible smartphone. [iv] Maximum image stabilization is achieved when using either the EF-M 18–150mm f/3.5–6.3 IS STM or the EF-M 15–45mm f/3.5–6.3 IS STM with the lens firmware update. [v] Compatible with iOS® versions 8.0/8.1/8.2/8.3/8.4/9.0/9.1/9.2/9.3, Android™ smartphone and tablet versions 4.1/4.2/4.3/4.4/5.0/5.1/6.0. Data charges may apply with the download of the free Canon Camera Connect app. This app helps enable you to upload images to social media services. Please note that image files may contain personally identifiable information that may implicate privacy laws. Canon disclaims and has no responsibility for your use of such images. Canon does not obtain, collect or use such images or any information included in such images through this app. [vi] Compatible with Android™ smartphone and tablet versions 4.0/4.1/4.2/4.3/4.4/5.0/5.1/6.0. [vii] Approximately 66% faster than the EOS M3 camera. [viii] Mount Adapter EF-EOS M is required when using EF/EF-S lenses for EOS M series digital cameras. [ix] Measured at the focal length of 150mm (35mm equivalent of 360mm), using the EOS M3 digital camera based upon CIPA (Camera & Imaging Products Association) standards. [x] Availability, prices and specifications are subject to change without notice. Actual prices are set by individual dealers and may vary. * Pixels may decrease due to image processing. Camera Start-up Time Approx. 1.0 sec. Continuous Shooting Time Based on 16GB Memory Card Movie Recording SizeRecording Bit Rate (Approx. )†Recording File SizeSingle Clip Recording TimeRecordable Time per a Memory Card1920 x 108059.94 fps35 Mbps4288 KB/sec.29 min. 59 sec.59 min. 30 sec.29.97 fps23.98 fps24 Mbps2945 KB/sec.1 hr. 26 min. 5 sec.1280 x 72059.94 fps16 Mbps1969 KB/sec.2 hr. 8 min. 27 sec.640 x 48029.97 fps3 Mbps382 KB/sec.10 hr. 22 min. 35 sec. Printable Images JPEG, RAW*, MP4 and MOV files are printable. Playback Time Approx. 4 hr. * Time when playing back a slideshow of still images.